Lapua brass is so good that you’ll be tempted to just load and shoot, if you have a “no-turn” chamber. However, some minimal case prep will ensure more uniform neck tension. Keeping your neck tension very uniform allows more consistent bullet seating. That, in turn, usually yields better accuracy, and lower Extreme Spread and Standard Deviation (ES/SD). Lapua brass, particularly 6BR, 6.5×47, .243 Win and .308 Win comes from the factory with tighter-than-optimal necks. Before you seat bullets, at a minimum, you should inside chamfer the case mouths, after running an expander mandrel down the necks. The expander mandrels from both Sinclair Int’l and K&M will both leave the necks with enough neck tension (more than .001″) so you can then seat bullets without another operation. Put a bit of lube on the mandrel before running it down the necks — but remove any lube that gets inside the necks before seating bullets. Both Sinclair and K&M Tools make a die body specifically to hold expander mandrels. The Sinclair version, is shown above. This $24.99 unit fits caliber-specific expander mandrels ($9.95) which measure approximately .001″ less than bullet diameter for each caliber. This is an updated “Gen II” design that completely captures the mandrel within the die so the mandrel cannot pull out. It also has an O-ring in the die cap that allows the mandrel to self-center within the case neck. 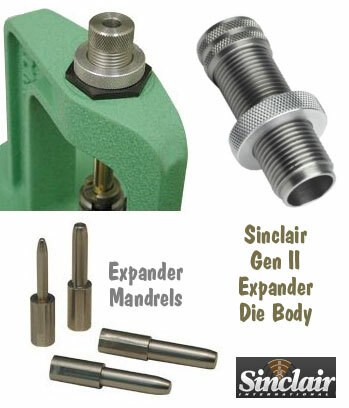 Sinclair now offers three sizes of die bodies for expander mandrels: .17 -.310 Caliber (#849-011-715WS); .357 – .50 caliber (#749-008-843WS), and a special .50 Cal die body for large-diameter 50 BMG presses (#749-009-163WS, $49.99). All Generation II dies are machined from stainless steel and the standard diameter 7/8-14 dies include the Sinclair Stainless Steel Split Lock Ring. Once you run the Sinclair expander mandrel down the necks of Lapua brass, after you account for brass spring-back, you’ll have about .002″ neck tension. This will make the process of seating bullets go much more smoothly, and you will also iron out any dents in the case mouths. Once the case mouths are all expanded, and uniformly round, then do your inside neck chamfering/deburring. The same expander mandrels can be used to “neck-up” smaller diameter brass, or prepare brass for neck-turning. If you haven’t acquired an appropriate expander mandrel for your brass, but you DO have a full-length sizing die with an expander ball, this will also function to “iron out” the necks and reduce tension. However, using a die with an expander ball will work the necks more — since you first size them down, then the ball expands them up again. Typically (but not always), run-out is worse when using an expander ball vs. an expander mandrel. Share the post "Neck-Expander Mandrels for More Uniform Neck Tension"
If you’re a serious shooter, the latest 5th Edition of the Ammo Encyclopedia (released in August, 2014), belongs in your library. This 1008-page book is probably the most comprehensive and up-to-date book in print covering current and obsolete cartridges and shotshells. Bussard’s Ammo Encyclopedia is a massive resource work. The 5th Edition now boasts 105 chapters, covering thousands of handgun, rifle, and shotgun cartridges from the past century and a half. One of the best features is a 12-page color section depicting actual size drawings of 265 current rimfire/centerfire cartridges and shotshells. You won’t find that many “life-size” cartridge drawings in one place even on the internet. Cartridge profiles and ballistic charts have been expanded to include all new factory cartridges. The authors have even included air rifle pellets and historical images and charts. Softcover, 1008 pages. 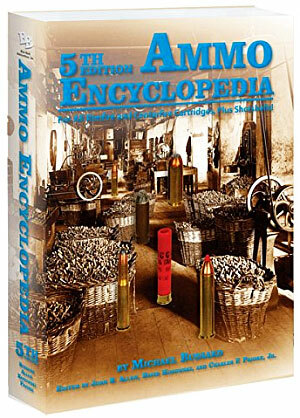 Share the post "Fifth Edition of Ammo Encyclopedia Now Available"